This should become an official Memorial Day, 4th of July and/or Veterans Day remembrance photo; “Our Nations symbol standing guard, over those who gave their lives guarding our Nation”. One of the most emotion-evoking photos I’ve ever seen. 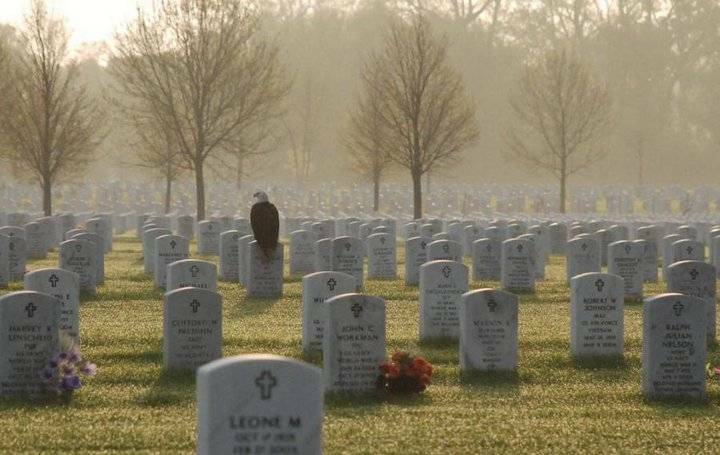 The photo below was taken at the National Cemetery in Minneapolis on a June morning as it appeared in the Minneapolis Star/Tribune. It has been said that a picture is worth a thousand words. This photo proves it. It says everything without a single word. “Our Nations symbol standing guard, over those who gave their lives guarding our Nation”. Marine Corps motto “Semper Fidelis” (Always Faithful)… seems fitting! This lone bald eagle seems to say “Many may have forgotten you; but I never will”.